The normal brakes on a Brompton are, well, “adequate” – the latest versions are okay, but sometimes more powerful brakes can be a good idea. I make several brake conversions for the Brompton – fitting disc brakes gives you much more powerful braking, which is also almost completely unaffected by the weather, mud or road dirt. Fitting disc brakes needs fittings welded on to the frame, but the disc brakes can’t be retrofitted to existing forks, they’re too narrow, so as with the Rohloff Brompton kit I make completely new forks in Columbus Zona steel. Front Disc Brakes: Don’t forget to tell me which colour you want the forks painted. Kit includes a new fork, front wheel, brake caliper, rotor and everything else you need. Rear Disc Brakes: Because the normal Brompton rear frame won’t work with disc brakes, for these kits I’ll assume you’re fitting either my Rohloff Brompton kit or Alfine kit at the same time. So this kit includes only the brake caliper, rotor, and all parts needed to fit with a gearing upgrade kit. Is it possible to use your fork with the Brompton Ebike Mini Set from V-fiets in Amsterdam , http://www.v-fiets.com/brompton-ebike-mini-set-317wh , and mount your disc brake or should I pose this question to V-fiets ? That seems similar to the Nano kit. That motor won’t work with a disc brake, but at least with Nano they can do a different motor which is disc-compatible – best ask V-fiets. Do the original mudguards still fit or do they need adjusting aswell? Does the bike still fold like the original fork? Yes, just a bit wider. Disc brake forks on large wheel bikes are generally heavier and stiffer than those for rim brakes in order to cope with the increased force concentrated on one side of the fork. 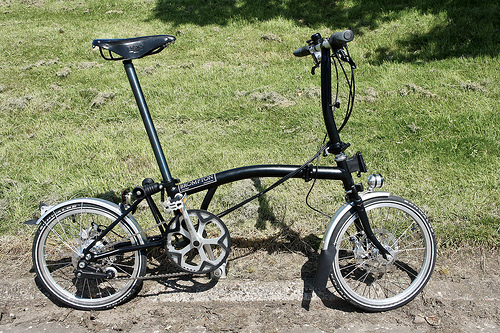 How do you manage to make your disc brake Brompton forks so light? Brompton forks are much smaller than big wheel forks, so the forces are different – it’s not necessary to use special heavy-duty fork blades, though I do use long-tang fork crowns to spread the load. After a Brompton has the Rohloff kit , front and read disc brakes , plus a gates drive , will the bike fit inside the B&W travel hardcase ? Yes, it still fits – you need to trim the foam padding a bit, and it’s a bit more of a squeeze, but it does fit in. what is the width of the forks, is it 100mm? I’m looking to fit a front hub motor compatible with disc brakes, what specifications/dimensions of a motor should I opt for? Yes, they’re 100mm OLN forks, and designed for 160mm rotor. Anything that fits that should be okay. How much weight do the disc brakes add when compared to the stock rim brakes? I think the hydraulics work out about 100g heavier per wheel. I have a 2016 H6R and my experience was that net loss/gain was exactly 0. Meaning it weighed the same before and after. I have a 2016 black edition (lime green). Is it possible to get the wheel in black? If possible, are there additional fees involved? Would appreciate further info on it. Thank you. Yes, no problem. There’s no extra cost for a black wheel. Would a front disc be possible with the Shimano Lighting Hub? I’m afraid not – the Shimano dynamo doesn’t have a disc mount on it. Do these brakes have to be bleed frequently, as the caliper will be moved from side to side, and then stored upside down for at least a few hours per day, does this mean that they have to bleed frequently. No, I’ve never had to bleed them – modern open systems don’t care about orientation. For the front hub, is there any 74mm front hub with Disc mount on it? and do you have the 74mm fork with disc brake support? I don’t know of any 74mm disc hub, my forks are 100mm OLN.